HOLBROOK has made a successful return to Hume Football League finals’ action by defeating old rivals Culcairn by 17 points in Saturday’s elimination final at Walbundrie. 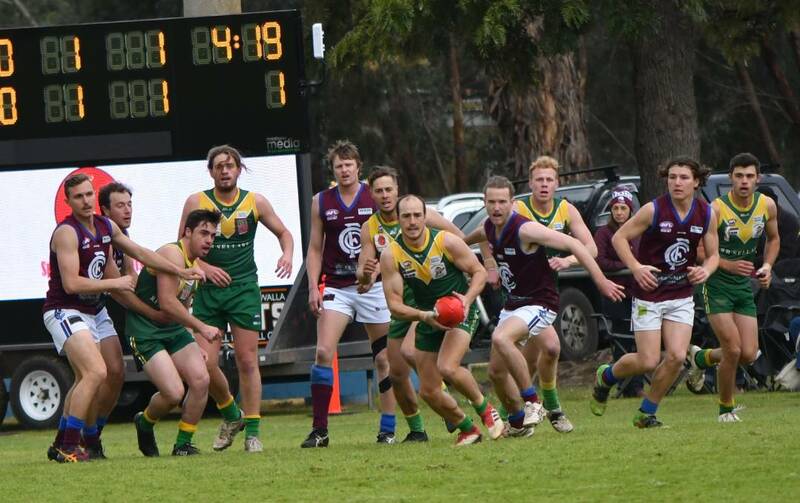 Before a huge crowd that paid over $20,000 at the gate, Holbrook finished the stronger in blustery conditions to progress to next Sunday’s first semi-final against Jindera. The Brookers, who had not played finals since 2013, maintained their good finals record against the Lions in recent encounters. Holbrook has defeated Culcairn in its last three Hume finals matches and has an overall record of 12 wins and eight losses since WWII against the old rivals. The Brookers’ victory could be put down to their excellent first quarter and a superior finish in the last quarter, with both sides astray in front of goal. Holbrook kicked four goals to one in the first quarter and then three goals to one in the last, as the Lions controlled the middle part of the game. 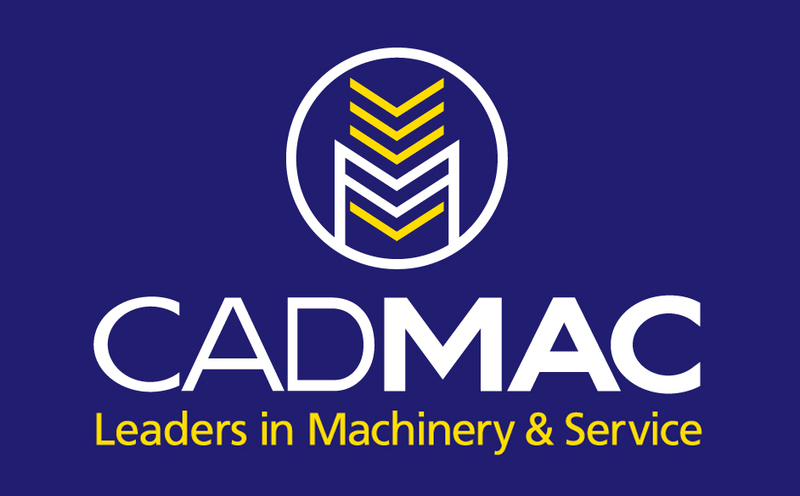 Culcairn had eight consecutive scoring shots from the end of the first term to midway through the second for just three goals. A tricky breeze and slippery surface contributed to the inaccuracy and poor disposal along with some relentless defence from both teams. Veteran ruckman Aaron Baker was awarded best on ground, taking many telling marks in the frenetic final term. Defenders Luke Carman, Isaac Lampe, and Brock Knights were outstanding for Holbrook limiting the dangerous Culcairn forward line to just six goals. Andrew Mackinlay was a standout forward on the day kicking four goals, while Ben Talarico bobbed up for two crucial goals. Holbrook coach Matt Sharp used the ball superbly with hand and foot, while Brad Carman was the most destructive midfielder on the ground. Culcairn were defiant in defeat with wonderful contributions from the Hallinan brothers Tim and Dane, Jye Shields. Caleb Simmons, and Ben Gould won plenty of possessions. It was a disappointing end for the Lions who showed its best football can be top shelf, being the only side this year who have beaten flag favorites Henty. The Brookers’ only injury concern was a severe corked thigh to Duncan Trethowan. Midfielder Gus Keogh could return from a finger injury. 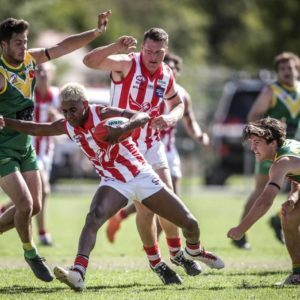 JINDERA came from 20 points down early in the game to upset defending premiers Osborne by eight points at Walbundrie on Sunday. In a dramatic finish, Trent Castles kicked his 100th goal for the season with the final goal of the game after a 50 metre penalty with two minutes left. Castles had been kept goalless in the first half before he booted the final three goals of the third quarter to fire up the Bulldogs. Osborne burst out of the blocks with some hard-running football kicking four of the first goals, before the Doggies worked their way back into the game. Despite an inaccurate second term when the kicked 2-6, Jindera were showing signs of taking control with Sam Myors, Jessie Harris, and Dylan Pettingill dominating. The second half was a beauty with both teams locked at 54-all at three quarter time and with the dangerous Castles starting to shine. Michael D’Arcy, Rhys Preston, and Harrison Weaven stood tall in the final term as the defending premiers threw everything at the Bulldogs. The match fluctuated in the final term with Dan Middleton from Jindera giving them the lead before Matt Rava goaled to put the Cats back in front. Pettingill got the lead back five minutes later for Jindera, before Castles 100th sealed the result for the Doggies and a semi-final next Sunday against Holbrook. In the end, it was the Bulldogs who had the extra legs and with eight more scoring shots fully deserved its impressive victory. Hayden Clark was terrific all day for the Cats, along with coach Matt Rava, Sam Rutland and big men Jamie Parr and Duncan McMaster. Sam Myors from Jindera was awarded best on ground and shapes as a major player in next week’s elimination clash with Holbrook. 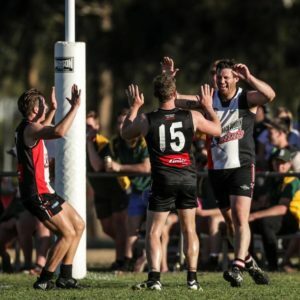 THIS Saturday will see a genuine blockbuster with Henty taking on Brock Burrum Saints with the prize for the winner a spot in this year’s grand final. The Saints will be hoping giant ruckman Matt Seiter passes a fitness test following a facial injury three weeks ago. When the two teams met earlier in the season they played out one of the best matches seen in the league for many years. Damian Cupido, Jarrah Maksymow, and Daniel Cox headline up a star-studded Henty side that should thrive on the wide expanses of the Walbundrie Sportsground.